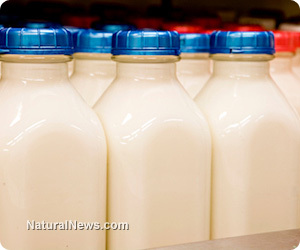 (NaturalNews) As the U.S. government continues to wage war on raw dairy products, several European countries have done just the opposite by expanding access to the food through unpasteurized milk vending machines. Taking to heart findings from current research, Europe has recognized the exceptional health benefits of raw dairy and subsequently promoted it. Compared with pasteurized and homogenized dairy, raw milk offers a wealth of nutrition - all without the drawbacks of oxidized fats, denatured proteins, antibiotics or growth hormones. In the so-called "land of the free," consumers are finding their right to choose wholesome food increasingly encroached upon by governmental agencies. Apparently, raw dairy products are so threatening to social order that a SWAT-style armed raid in 2010 by local, federal and even Canadian agents illegally trespassed and stole raw dairy products, as well as computers and honey, from Rawesome Foods, a private buying club in Venice, California. And this is only once instance of many across the nation - comparable raids are occurring with little legal oversight. Supposedly acting in the interest of public health, the agents conveniently overlooked the fact that Rawesome Foods is private membership only and isn't open to the public. Lets also turn a blind eye to the fact that raw dairy is legal in California and nutritionally outshines its pasteurized, homogenized and (frequently) chemical-laden brethren. Moreover, three studies in Europe discovered that drinking "farm" (raw) milk protected against asthma and allergies. And a range of illnesses responded favorably to the Mayo Clinic's (raw) "Milk Cure" - such as cancer, weight loss, kidney disease, allergies, skin problems, urinary tract issues, chronic fatigue and prostate disorders. Additionally, hundreds of testimonials attest to the healing power of raw milk in helping childhood behavioral problems, digestive disorders, failure to thrive in infants, arthritis, osteoporosis and cancer. In response to the first-rate benefits of raw milk, several European nations have installed self-service vending machines that provide access to the food 24 hours a day. Brainchild of dairy farmer Michel Cantaloube, the machines have been stationed around France, the UK and Spain - supplying local, sustainable and unpasteurized milk to surrounding communities. The dairy farms involved hope to expand the venture into a similar vending machine for raw yogurt. Other countries like Italy, Slovenia, Austria, Switzerland and the Netherlands have begun to install their own raw milk vending machines as well. Lancet. 2001 Oct 6; 358(9288):1129-33. J Allergy Clin Immunol. 2006 Jun ;117(6):1374-8. Clinical & Experimental Allergy. 2007 May; 37(5):627-630.